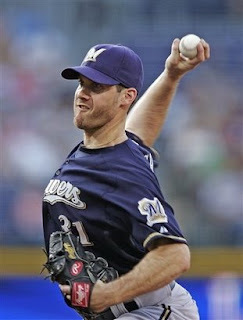 Milwaukee Escapes With Victory Over Braves ~ The Bucky Channel - The World of Sports from Wisconsin's Perspective. I don't know who's wearing number 31 for the Brewers these days, but it certainely isn't Dave Bush. After going 7 no hit innings in his last start, Bush follows up the performance with a 4 hit, 1 run outing. I don't know who you are, Dave Bush imposter, but I'm glad to have you. Bush was lights out in the beginning, and so was the Brewers offense, scoring 4 runs in the first four innings. Just as was the case on Monday, 4 early runs would be all the Brewers would need. The Braves did attempt a comeback, but Salomon Torres was able to hang on and pick up his 13th save of the year, as the Brewers won 4-3. And hey, the Cubs lost too! That's all I got for you tonight, I wasn't able to watch the game because I was driving through central Wisconsin, and as I've learned, there is no Brewers signal within 60 miles of Oxford, so that's too bad. Also, I'm resting up for a day trip to Chicago tomorrow, so Bear will take care of the recap tomorrow afternoon. We'll be back in business on Thursday, with a live blog during the Russia/Spain Euro '08 semi, to get us warmed up for our NBA Draft live blog which starts at 6pm. Also expect an article about Brewers trade possibilities sometime this weekend. Thanks again for your patience, and while we're here, we'd like to make a shoutout to our friends at the Fond du Lac YMCA! TBC's Player of the Game: Dave Bush. What the heck were you in Oxford for? What the heck is ANYONE in Oxford for? If you mention CC Sabathia as a decent possibility for the Brewers, I will give birth to a litter of kittens & then train them to attack you. He. Is. Not. Worth. The ... trouble. Also, if you want something crazy to write about, how about soon-to-be-former Stros pitcher Shawn Chacon going all Sprewell on THE ASTROS GM!!! We just had the first day without a new post in Bucky Channel history! NOOOOO! We'll make up for it as soon as I head back home (and I sure as hell am not driving through Oxford this time).